At long last, we've escaped the evil clutches of October and have moved full on into November, generally a month full of promise. Every year during this time, we see a number of movies with big box office potential, as well as several film that are released with the intention of capturing end-of-year awards glory. This November looks to be somewhat lower key than usual, what with Harry Potter and the Half-Blood Prince having been moved to a Summer 2009 release and the writers' strike affecting the quality and quantity of awards candidates. Nonetheless, we kick off November with a pretty significant heavy hitter. Madagascar: Escape 2 Africa is DreamWorks Animation's sequel to the 2005 CGI-animated film that features the voices of Ben Stiller, Chris Rock, Jada Pinkett Smith, David Schwimmer and Sacha Baron Cohen. That movie hit theaters over Memorial Day Weekend, pulling in $47 million in its first three days before going on to earn a domestic total of $193.6 million. Its worldwide gross (domestic + international) was a whopping $532.7 million. The studio had to be pleased with the results. 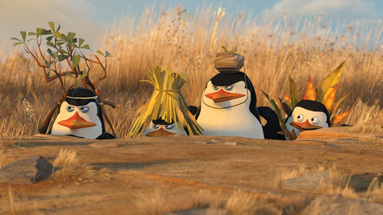 Madagascar's budget was a reported $75 million, which means it was hugely profitable even before international receipts, DVD and other merchandising were tallied. There's a perception that the original Madagascar is one of the lesser DreamWorks Animation movies, and it's justified. Unless the penguins from the film are onscreen, it's fairly laborious to watch. With that said, though, kids really like the characters, particularly King Julien, Lord of Lemurs. If you didn't know, he "likes to move it, move it". As annoying as the song might be to you or me, kids eat it up, and the studio capitalized upon that fact when it released the trailer for the sequel into theaters. This is savvy marketing, and the studio has been pushing the product going all the way back to June, when the preview was attached to prints of Kung Fu Panda. Thanks to the fact that it's a very safe family choice and a known entity, Madagascar: Escape 2 Africa should be able to expand fairly significantly on the debut weekend total of the original. I believe that a three-day total of $58 million is reasonable, though tracking actually has it a bit higher.